A city trembles. The evil General Kurtz has seized it for himself and rules over its citizens with an iron fist. Tactical, ruthless, and commanding a vast army of heavily armed soldiers, is there anyone out there who could possibly oppose him? As a matter of fact, there is. Representing the last vestige of the Old World, the United Armed Forces is ready and willing to take the fight to General Kurtz. They may not have his numbers, but what few soldiers they do have represent the greatest warriors the world has ever seen. Warriors so legendary, they can only be called Heroes. Hero Hunters puts you in the thick of battle, with enemies all around, your path to retreat cut off, and no reinforcements coming. The only way out is forward under a hail of gunfire and over a mountain of corpses. - Assemble a team of up to five Heroes from a roster of over 40 unique characters. - Fight hundreds of action-packed battles against overwhelming odds. - Switch between Heroes in real time and unleash their destructive capabilities on your foes. - Mow down enemies with futuristic machine guns, sniper rifles, destructive shotguns, explosives and more! - Play through the singleplayer campaign, join other gamers in cooperative raids, or test your skills against another person in intense player-versus-player combat. Do you want intensity? Hero Hunters has intensity. It literally comes in droves of enemies ready to pump you full of lead, whole city blocks erupting in fire, and your Heroes defying the odds over and over again with every victory they rip out of death's hands. 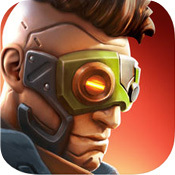 You won't find a better shooter for your phone, so get Hero Hunters now and let the battle be joined! Assuming you have the guts for it. With shooters being so tremendously popular on PC and consoles, they've become something of a holy grail for the mobile game market. Many mobile developers have tried to give the genre a shot in the distant hope that they'll emulate the success of their big screen counterparts, but most of their efforts so far have felt less like hit or miss, and more like graze or miss. Hero Hunters is the latest of these offerings to step up to the plate, which leaves curious gamers wondering if this will be the one to succeed where the rest all failed. 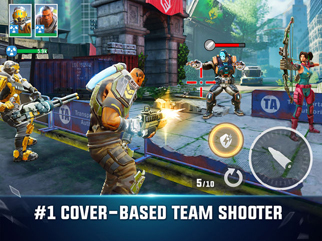 The good news is the app is arguably the best mobile shooter out there. The bad news is that there's some sketchy fine print. Everything about Hero Hunters appears pretty typical when you first load it up. You step into the boots of some typical-looking rugged, eyepatch-wearing soldier guy, you learn his name is a very typical-sounding Jackson, and you use his very typical assault rifle to gun down some typical mooks in a typical-looking urban war zone. You aim using your left thumb, shoot with your right one, and through some well-timed screen strokes, hide behind whatever cover is available. If you've played a cover shooter in any capacity, you should know what to expect here. Things take an unexpected turn when another character, identified as Nightingale, enters the scene and you suddenly find yourself taking control of her. From here, it becomes apparent just what this game is about. You won't be operating one commando in the field, but a whole team of them, and this is what makes Hero Hunters suddenly very interesting. Your squaddies, referred to as Heroes, are all equipped with different weapons and skills that make them more suited for handling some situations better than others. Jackson, for instance, is a frontline soldier who guns down enemies and can take out multiple foes at once with his special rocket attack. Meanwhile, Nightingale is a sniper who can pop more distant threats from afar while healing her teammates. Things only spiral on from there as you acquire more and more heroes each with their own specialties. You can form a team of up to five people and switch between them on the fly, letting the computer control the others. In general it works really well; AI-driven companions are pretty good at shooting accurately and staying safe, though they won't always be the most tactical of thinkers. Enemies come in many forms with classes of their own, including basic infantry, snipers, heavy gunners that can destroy your cover, and even medics. Some targets are going to be higher priority than others, and identifying who they are and executing them in swift order is important to succeeding. Overall, the gunplay is great. It feels good and it looks good. 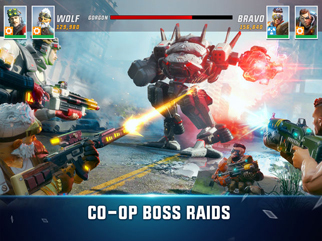 The graphics are on a similar technical level to a PlayStation 2 game, and the art direction, while clearly borrowing elements from popular shooters like Gears of War, Mass Effect, and Overwatch, is colorful and bombastic. The heroes all look very distinct from one another, which is impressive considering there are over 40 of them, every weapon feels powerful, and it's great fun to switch between them and unload their fury on the enemy. What's especially cool is how much the developers understood everything people love about shooters. There's a story campaign that you can play through by yourself, but there are also a couple of multiplayer options to tackle if your gaming needs some more human interaction. You can play cooperatively with other players for instance, combining your respective teams to take on greater challenges, or even pit your guys against another player's for some online PvP! The only issue is that the controls for Hero Hunters aren't always as responsive as they should be. Aiming is serviceable, but still prone to touchscreen imprecision, and the game seems to have a hard time moving your characters into cover when you want, leading to them taking a lot of damage they should have been able to avoid. What's even less fun is the actual managing of your heroes in between battles. Leveling them and rearranging your team is all well and good, but after getting your first few heroes, you'll start to notice how your crew is seeing fewer special abilities, and the only guys with anything worthwhile on seem to have a price tag attached. Hero Hunters may be free to play, but by locking some of its more exotic and competitive aspects behind a pay wall, it's very passive-aggressively urging you to break out that credit card. On top of that, the app also utilizes energy meters and limited skill points needed to level up your soldiers, and while those recharge over time, they're still inconveniences that are deliberately designed to annoy you into paying more. With so much already barred off from you, this just feels especially petty. Hero Hunters looks fantastic, and plays nearly as well too. Unfortunately, it also feels too greedy with how it gates much of its content behind a pay wall. You can certainly play without spending a cent if you're so inclined, but you will feel the grind in singleplayer and be at a disadvantage in multiplayer. Give it a look, but understand the caveats.